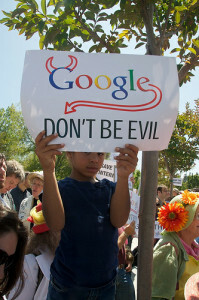 “Google works very hard to make sure that actions on third-party sites do not negatively affect a website. In some circumstances, incoming links can affect Google’s opinion of a page or site. For example, you or a search engine optimizer (SEO) you’ve hired may have built bad links to your site via paid links or other link schemes that violate our quality guidelines. First and foremost, we recommend that you remove as many spammy or low-quality links from the web as possible. See that first sentence? Google works very hard to make sure that third-party sites do not negatively affect your website – how nice of them! Does this mean that Google are trying to protect your website from Denial of Service attacks from other sites? No. Does it mean they are looking out for links that point to your site identifying unsecured admin areas or security vulnerabilities that can be exploited? No. What it does mean is that Google are trying to actively punish sites that they think have obtained links in ways that violate their quality guidelines but they will ‘do their best’ not to punish your site incorrectly. This is a terrible idea! Method A: If Google identifies a site or a page as being ‘spammy’, it gives no ‘link juice’ to any pages pointed to by the outgoing links. Similar to treating all links as if they had rel=”nofollow” on them. This way no-one benefits from these links but no-one loses out either. Method B: If Google identifies a site or a page as being ‘spammy’ it punishes all sites that they link to by reducing their page ranks. With method A, the links from the ‘spammy’ site are useless and no-one needs to do any extra work. With method B, the links from the ‘spammy’ site are harmful and EVERYONE needs to do extra work. Why? Because now you are potentially being punished because of links that are pointing to your web site which you have no control over! What annoys me even more is SEO folk who think that Google (all bless it’s holy name) is playing fair here and that we should just bend over backwards and accept it. But let’s face it; they would think that because it gives them more work to do and therefore keeps them in a job. What’s next? What’s to stop Pepsi paying dodgy sites to link to Coke’s website in order to punish them? Nothing. What’s to stop webmasters of the dodgy sites making money out of this by threatening to link to your website from loads and loads of different dodgy URLs unless you pay them a ransom? Nothing. Nothing at all. You could always pay for AdWords? AdWords would be an alternative for driving traffic to your site, if you wanted to ignore SEO issues affecting the site in question.